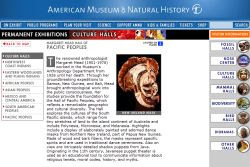 A few weeks ago I read a story about a new tour at the American Museum of Natural History. As part of an educational program for college students, 19 year old Jing Li had designed an “insignificance tour” of the museum, which he’s been conducting throughout the summer. The idea is for students to come up with original tours based on the exhibits already at the museum. I thought it would be fun to take the tour with Li and a group of students, record it and make a little radio piece. Unfortunately things fell through with the news outlet that I was going to do the story for, and all I have left is a background interview I did with Li. So I figured I’d put an excerpt up for you to hear. Li says he hasn’t chosen his major yet, but he’s thinking about philosophy or economics. I suggested that economics didn’t seem to fit in with the ponderous nature of his tour, but he begged to differ. Li will continue to conduct the tour for school and camp groups through August 10th.